The song, originally recorded by Depeche Mode in 1983, addresses corporate greed in the music industry. With lines such as “grabbing hands/grab all they can/all for themselves after all” —sung in Dicken’s video by his children, Milah, 8, and Korben, 5 — the song seems to resonate today with an audience that remains in a fight against the dominance of large corporations. After the video had first become popular in Europe, Dicken, who posts his videos to his Youtube channel, said he saw a huge jump in hits the weekend the video reached America. Dicken was born in Bogotá, Colombia, where he currently resides. He moved to the United States in 1994, where he attended college and worked for MTV in Miami and then worked for VH1 in New York City. After living in the United States for fifteen years, he moved back to Colombia three years ago. He currently owns a video production company called Bualá. In Colombia, Dicken said he’s begun to be recognized on the street since his cover of “Everything Counts” went viral, as the video has showed up on television and in the press. 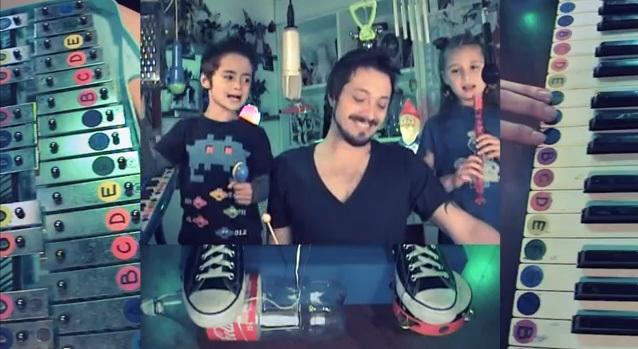 Due to the sheer number of times the video made my day after I first saw it on Colorlines.com under the headline “Dad Teaches Kids Everything Counts With Depeche Mode Song,” I decided to reach out to Dicken to learn about his video making process and his use of music to teach his children about the world. Gena Mangiaratti: How do you put together your videos? Dicken Schrader: Like how a magician doesn’t reveal his tricks, I don’t want to say how I do these videos. All I can say is they’re not live performances. I could never play all those instruments at the same time, live… I’m not a musician. I was never properly trained in any instrument. I have a lot of musician friends. When they’re really good, they started very young. That’s something that I didn’t have, so I don’t claim to be a musician because I’m not. I just love music…What you hear is actually us playing, but it’s not playing live. GM: How did you get interested in being a video artist? DS: It’s always been my thing. Maybe I didn’t a grab guitar when I was 12, but I grabbed a video camera, one of the first Handycams…That was my pride and joy back then, and I started doing slow motion and animation. I had a bunch of Transformers cause I’ve always been a geek, so I started animating Transformers and it just started there. I just love playing with images and taking an audience — it could be five people or it could be a million — through a special journey through sound and sight. That’s always been my thing. GM: How do you teach the songs to your children? DS: We listen to a lot of Depeche Mode songs, and all of us together agree on the ones that we could probably play with our instruments and would probably sound cool. It’s actually very personal messages, so every song that we record, the lyrics have something to say about the moment in our lives when it’s happening. So after that, we decide on a song. Then I write down the sheet music, but we do it with colors like you see in the video. Every key has a color, so we do it visually with color. I write down their sheet music and they start practicing right away, and they love it. I wake up on a Saturday morning and they’re already awake playing the song, and that’s what they fight about, that’s what my kids fight about — when they’re practicing and someone makes a mistake on a note. And I love it. I love that that’s what my kids fight about, like a real band in a studio session. GM: With every song you cover carrying a personal message, what inspired you to make the “Everything Counts” video when you did? DS: I’m starting my production company — that was happening last September. I was signing contracts, and handshakes, and it all made sense: This is the song right now for me, for us. Everything that’s going around in the world also — the Occupy Movement — that’s exactly what this song is talking about: The grabbing hands that grab everything that they can; they leave the other ninety-nine percent out of it. So this song is thirty years old, but it seemed to me that it was talking about our time, and it just made perfect sense. GM: Did you expect it to go viral like it did? DS: No, never. Ha. It’s the third one we did. The first one was a very personal message that I had to send out, or leave a record of it, “Shake the Disease.” In it, the kids actually play a spray can and some scissors and they’re kind of distracting me, which looked, to me, kind of poetic at the time: Trying to play all those instruments at the same time, and on top of everything, having my kids making it harder for me. I never expected to do anything beyond that. That was the thing, it was just that video. It was the kids that started asking me to do more. They wanted to get more involved musically. Korben started hitting a can of chocolate mix, and now he’s playing keyboard solos, so I wonder what comes next. I hope at some point I’ll be the old guy in the background playing the maraca, that the roles are switched. GM: Is it an intention of yours to teach your kids about life and the world through the songs you play, as stated in the Colorlines.com headline? DS: Definitely, and that’s why my kids have no idea who Justin Bieber or Hannah Montana are. All the kids [in] their grades know who they are, and my kids have no idea. I’m so proud it, that what they’re listening to is Depeche Mode, singing about the grabbing hands. I think people tend to think that because they’re kids, they have to play the Old McDonald CD for them, and no, the kids are ready to listen to something intelligent, and that’s what I’ve played my kids since they were babies. When they were babies they learned the melodies, and now they’re starting to pay attention to the lyrics, and I love it. I think Depeche Mode has amazing lyrics that speak about life, at least life the way I see it, and I’m glad that my kids are picking that up from me. GM: Have you always kind of been drawn to politics and social justice? DS: I’ve always been involved in that, but when I moved to New York, that’s when it really hit me. I became very, very political. Actually, I did a couple of music videos against the Bush regime. One of them had a Depeche Mode song on it. That was the first video that broke the million hits for me, but it was taken down because of Warner copyright infringement — Again, the grabbing hands, grabbing all they can. So yeah, I was very political. I would go out to street marches, and I bet if I were still living in New York I would be camping outside Wall Street. GM: Why do you think the “Everything Counts” video in particular was the one that went viral? DS: I think so far it’s the best one we’ve done musically. It’s the best cover, and also the kids are so much more involved musically. Korben is playing the keyboard, and they’re singing the whole chorus, which I think is adorable — that’s the comments that I get a lot. So I think it had all the ingredients put together, plus what we were talking about, the lyrics that I think, even subconsciously, [are] ringing in the people’s heads. I’m glad that also the Depeche Mode song, the original one, is getting a lot of new hits because of this. I’m really proud that people are listening to Depeche Mode again because of me, or us. GM: What’s it like now to be recognized on the street from the “Everything Counts” video? DS: It’s so ironic because I’ve had a career of twenty-five years of trying to make it big somehow, and it never happened. And the first thing that I do, just hanging out with my kids, completely non-intentionally it becomes a huge hit. It’s amazing. I think it’s a lesson for us all, you know? Life always happens in the least expected way. GM: Do you have any plans to cover other artists in the future? DS: We cover other stuff, like we’re listening to Gorillaz. There’s this song, “On Melancholy Hill,” that we love, and when it just pops in the shuffle we all know what to do and then the kids just start playing it. But we do it like, playing. I don’t think we’ll record it because our thing is Depeche Mode. You can’t change horses in midstream. GM: Can’t change horses in midstream? DS: Yeah. That’s very political, isn’t it? Ha. No, I think we’re already stuck on Depeche Mode, there’s so much Depeche Mode material that I want to cover and it’s like my favorite band of all time, so as much as we would like to cover other things I don’t think it’s in our plans. We already have a queue of I don’t know how many Depeche Mode songs that we want to cover, so it’s going to be very hard for us to switch from there. GM: Thank you so much. Is there anything else important? DS: Yeah: Daddies, don’t let your babies grow up to listen to Hannah Montana. DS: Yes, the best advice I can give.